Well, I did said I could not imagine a year without the Little House books. And so it is that Paula @ The Vince Review is hosting a year-long read-athon of the Little House series and a few other books to equal one book a month in 2018. I need not an excuse to read these books, but I like to pretend that I have a reason. Last year, after I completed eight of the series books, I told myself that next time I read them, I want to focus on the proverbs, or words of wisdom, that Ma and Pa and Laura shared about life and human nature. This time I will see how many I notice and write them down. If you are interested, there is no sign up, but you can follow at Paula's blog. Hooray, let's bring it on. I have Little House in the Big Woods all ready to go. I be interested to see what you think of 'Caroline: Little House Revisited' as Ma's childhood would be very interesting. I also own several of the novels about Rose's childhood by Roger Lea MacBride, which I loved at the time 💕 Very hard to get enough of such an interesting family, through all generations. Hi, Paula, sorry! I was meaning to get to your message here. I've never read any of those other books about Rose or of any of stories about Caroline. Maybe one day I will. But I do look forward to reading this new release, Caroline. This read-along is so tempting but I have to limit myself this year. Perhaps I can manage one or two though. Have fun! I know that you love these books! 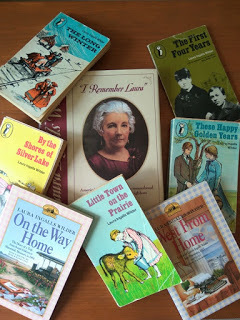 If you can only read one or two, you should try The Long Winter, Little Town on the Prairie, and/or These Happy Golden Years. (In that order, if you read more than one.) Laura is older and coming of age. It's just more involved than her younger years. Anyway, I know what you mean about limiting yourself.